A few days before we drove to Glacier National Park, the Reynolds Creek Fire broke out and closed the Going to the Sun Road so that driving all the way through the park was impossible. Waterton Lakes in Canada was fire-free (and wet, as you can see in the photos) so we changed up our route. Instead of our original plan to camp, we splurged and stayed at the Prince of Wales Hotel. We had high tea overlooking the lake and then toured the park in the car as it was raining. We were able to drive down into Glacier the next day. The photo below was taken along the drive. There were many times when we had to drive very slowly around cows lying in the road. 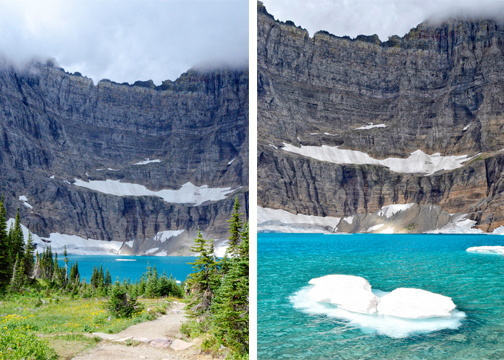 Once inside the park, we hiked to Iceberg Lake from Many Glacier, which was not impacted by the fire. The lake was beautiful and I am so glad we chose this hike. There were clouds seeping over the tops of the mountains but we managed to enjoy a dry and partly sunny day. On this trip we saw bighorn sheep, mountain goats, bison, deer, and cows (!) but no bears. I am looking forward to exploring more of this place someday.